The pairing of works by classical composers whose aesthetics are diametrically opposed to one another can sometimes reveal surprising, unforeseen similarities. Other times, the end result can be a schizophrenic listening experience. The Kronos Quartet has (for the most part) successfully navigated such waters for years. 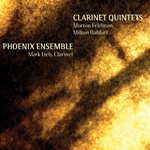 The Phoenix Ensemble, a mixed chamber ensemble from New York, manages the same feat on Clarinet Quintets: Morton Feldman, Milton Babbitt. Though the combination of Feldman and Babbitt may seem incongruous at first, a close listen reveals subtle parallels between the two composers writing. Members of the Phoenix Ensemble, led by Founder and Artistic Director, clarinetist Mark Lieb, work wonders with each piece, drawing out the understated dynamics of the Feldman, finding common ground in the Babbitt. Feldman's minimalist tendencies rely on subtle changes in volume and intonation, incurring dulcet, languid phrases that develop at a glacial pace. As the inventor of total serialism (an extension of Arnold Schoenberg's twelve tone technique) Babbitt's work is infamous for its rigorous sequencing, dense chromatics and contrapuntal intricacy; complex structures that are generally at odds with the linear simplicity of minimalism. Exuding somber tranquility, the Feldman piece ebbs with solemn grace. Drifting laconically between subtle themes and movements, it unveils a nuanced yet kaleidoscopic array of colors and tones. Unfolding less assertively than some of his more vigorous works, the Babbitt builds gradually, adding layers of interwoven counterpoint and shifting rhythms. A world premier recording, Lieb's clarinet follows the same model of lyrical restraint as the Feldman piece, never stridentseamlessly integrated into the sinuous fabric of the string quartet. Track Listing: Morton Feldman: Clarinet and String Quartet; Milton Babbitt: Quintet for Clarinet and String Quartet. Personnel: Mark Lieb: clarinet; Aaron Boyd: violin; Kristi Helberg: violin (1); Alicia Edelberg: violin (2); Cyrus Beroukhim: viola; Alberto Parinni: cello (1); Bruce Wang: cello (2).